The Renault Twingo GT should be the perfect antidote to modern, heavy, stupidly powerful hot hatches like the Ford Focus RS. It’s affordable, cheap to insure, has a modest 110PS power output and yet it’s light and fun, with an enjoyable exhaust note, livened up styling and peppy performance. The engine is the same 0.9-litre three-cylinder petrol you can get in the regular 90PS Twingo, but the turbocharger has been reworked, as have the electronics and exhaust system to increase power. Torque is up too, from 135Nm to 170Nm – and there’s a new intake above the left rear wheel to feed the greedier engine some extra air. Despite the changes, it’s hardly a blistering performer, with 0-62mph taking 9.6 seconds. But there’s more to the Twingo GT than performance figures. Renault has stiffened and lowered the suspension, fitted some specially-designed Yokahama tyres and tweaked the steering to make an already entertaining car even more fun to drive. Power is delivered in a fizzy, enthusiastic sort of way and there’s a surprising amount of pace. It won’t win at a drag strip, but for a county road it’s plenty and, since it’s not obscenely powerful, you don’t end up fearing for your driving licence every time you put your foot down. Through corners the Twingo feels nimble, with quick steering and a decent amount of grip. However, like the standard Twingo the steering lacks feedback when pushing on hard and so, despite the engineering team’s best efforts, it’s still not quite a full-on hot hatch experience. It’s fun, but just not quite involving enough. On the plus side, the GT is still a great town car. The suspension changes aren’t so radical that they ruin the ride quality over speed bumps, while the almost comically small turning circle means u-turns are possible even on narrow roads. It’s the perfect companion in supermarket car parks, too, since reverse parking manoeuvres are effortless. Economy remains decent. It’s not quite as impressive as in the 90PS petrol, but an official figure of 54.3mpg isn’t bad at all. In Real MPG, owners of the less powerful Twingo typically get just shy of 50mpg, so you can expect similar economy from the GT in real world driving. Practicality isn’t bad, with rear doors for back seat access and enough passenger space for short trips. The engine lives under the boot floor, meaning the load area is quite high up and isn’t huge. And it gets warm, so if you’re buying ice cream or chocolate be aware that it might melt before you get it home. The rear seats slide forward a little, so you can maximise load space or passenger knee room, depending on your needs. The driving position is quite high up and there is limited adjustment in the seat and steering wheel, so particularly tall drivers will struggle for comfort. The glovebox is a decent size and there are some cupholders, but threy're in an awkward spot behind the gear lever. A removable storage box sits in the cupholder area too and when it's in place the cupholders can't be used. GT models are based on the Dynamique trim level, so come with a decent amount of standard gear including cruise control, a speed limiter, electric windows and door mirrors, air conditioning, auto lights, auto wipers, DAB radio, and Bluetooth connectivity, on top of the beefier GT styling and 17-inch alloys. That does leave a few styling extras on the options list, along with the Techno Pack, which adds a seven-inch touchscreen system with navigation and 36 months of TomTom Live updates, along with a reversing camera and better speakers. That’s something plenty of drivers will want and it costs an extra £600. So, with a few extras like a vibrant paint finish and a sat nav, the Twingo is affordable, but it isn’t exactly cheap. For roughly the same price you can get a bigger, quicker, and better-to-drive Ford Fiesta ST-Line. 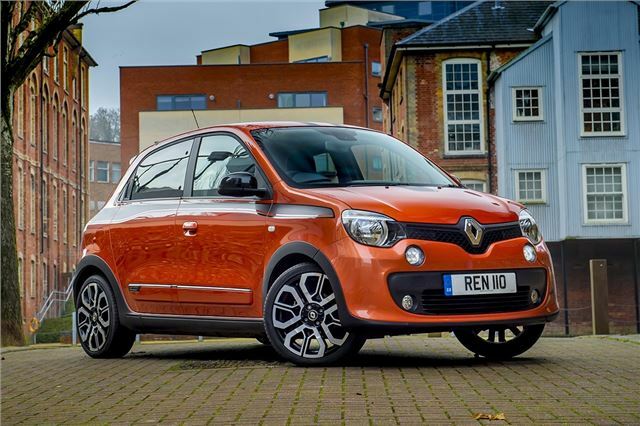 But if you want a great town car that’s cheap to run yet capable of raising a smile on a B-road, the Twingo GT is ideal.